I didn’t mean to just completely disappear (oops) I have just been having a really hard timing sitting down at my computer and writing something. That doesn’t mean I haven’t been sewing. When I have a few spare moments I have been doing just that and I have stack of things that I need to photograph (and iron because I have already worn them) to share with you. It has been a crazy busy last couple of weeks to boot. Blueberry is only 8 months old and she has decided to start standing on her own and climbing the stairs with impressive speed. Cupcake is busy and opinionated. She just turned 2.5 and decided that she is going to potty train herself! She is doing really good! It is really nice only having to wash one kids diapers instead of two. To make it even better she has Avengers underpants (dad took her shopping). They crack me up! In addition to the kids, the man of the house and I got engaged a couple of weeks ago!!! Going to make this legal! Needless to say my brain has not been on writing anything other than an email to our venue lady. So back to sewing! One of my favorite hobbies. 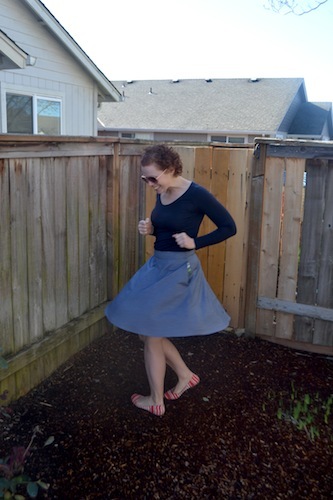 I recently made a half circle skirt, yes it is self drafted, and am really quite happy with the results. 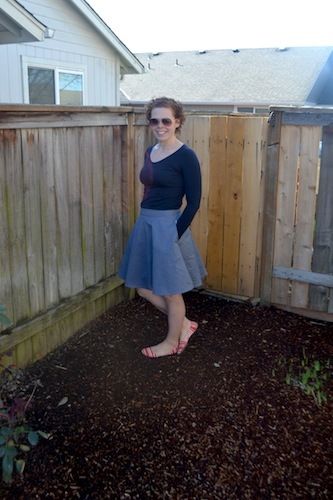 Despite the fact that I don’t normally wear things at my natural waist I decided to make this skirt hit just there. 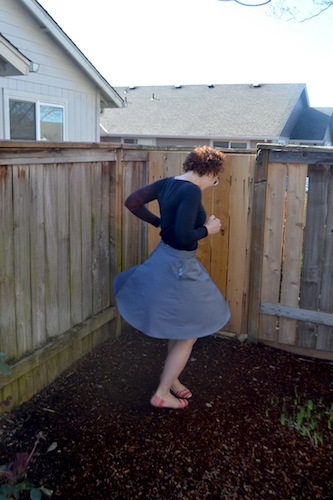 For some reason I don’t think fuller skirts look right when they are worn any lower. Not to mention wearing it a little higher gives it that retro June Cleaver look that I really like. I did add inseam pockets on the sides and moved the invisible zipper to the back. I have found lately that I have been putting pockets in less and less items. Maybe because I am a mom that carries a diaper bag around that most people would use for a European vacation so I don’t usually need them but I have also been noticing that a lot of the more “Audrey Hepburn” style pieces don’t usually have them. So I have slowed down my pockets lately. 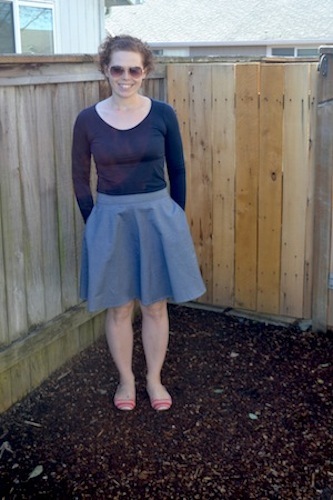 This fuller style skirt is super comfy and makes you feel about 5 years old again. In the long run I would consider making a couple tweaks and publishing this pattern, at least giving a tutorial on how to make it. What would you guys like? Have a great Tuesday and happy belated Easter!